This week – we’re all about non-traditional Easter egg hunts for kids. As much as I loved the traditional chocolate egg search that my Mom and Dad did for my brother, sister and I as kids, I also love planning something a little extra for my 3 year old son, Onetime. Maybe it’s because my son is an only child, or maybe it’s because I miss planning and teaching a classroom of kids, but sometimes it’s fun to go a little bit overboard! And usually that little bit of extra time it takes to make an everyday moment extra-special – is worth it when I see the look of excitement and surprise on my son’s face. With that in mind, I’ve collected 18 awesome non-traditional Easter egg hunts for you to peruse today. Some of these hunts incorporate the traditional chocolate egg hunt (see my Easter Bunny Clue Hunt, Crack the Code Hunt, and Easter Egg Hunt Map Reading). Some of them are completely unique (check out the two glowing easter egg hunts and the Dinosaur Egg Hunt and Hatch). I even have some educational hunts – because who says that kids can’t learn a bit while having fun? Whatever tickles your fancy – I hope you find what you’re looking for – and that the kids do too this weekend! Easter Bunny Clue Hunt from One Time Through. Dinosaur Egg Hunt and Hatch from Adventure in a Box. Lego Easter Egg Hunt from Frugal Fun 4 Boys. ABC Egg Hunt from Toddler Approved. Easter Egg Number Hunt from A Mom With a Lesson Plan. Crack the Code to Find Eggs Hunt from Science Sparks. Easter Egg Hunt for Missing Numbers from JDaniel4’s Mom. Easter Egg Scavenger Hunt with Picture Clues and Easter Egg Hunt Map Reading from Inspiration Laboratories. Easter Egg Alphabet Sounds Hunt from Stir the Wonder. Alphabet Egg Hunt Game from Modern Preschool. Search and Build Springtime Sensory Bin from Dabbling Momma. Glow in the Dark Easter Egg Hunt from Paging Fun Mums. Easter Egg Hunt Game from Preschool Powol Packets. Glowing Easter Egg Tub Hunt from Learn Play Imagine. Easter Egg Hunt Bubble Bath from Mommas Fun World. Watercolor Crayon Resist Easter Egg Hunt from Mom Inspired Life. Reverse Easter Egg Hunt from Crystal and Comp. Hope you found the perfect idea for your non-traditional Easter egg hunt today! Hope you and the kids have a blast this year. 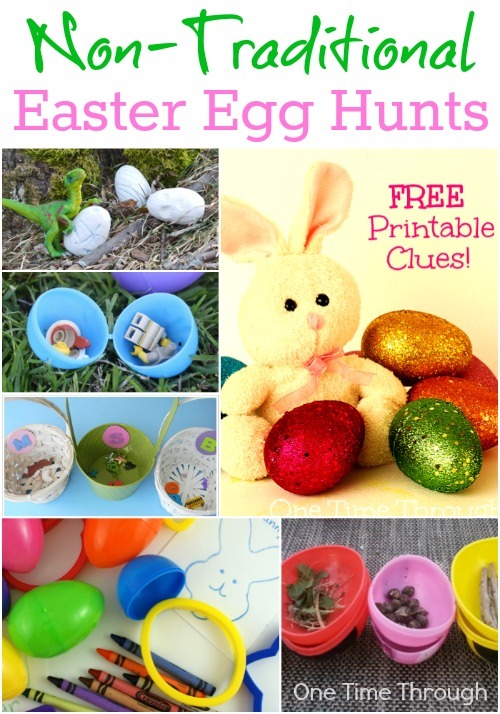 What fun non-traditional Easter egg hunt ideas! Thanks Shelah and thanks for dropping by and linking up! Thanks for featuring my crayon resist egg hunt! Such a fun activity! Thanks for dropping by! Wow, what a great list of Easter hunts! Pinned. Thanks also for including our Springtime Sensory bin with your other great features…..Happy Easter! Thanks for dropping by Susen! Have a great Easter too!